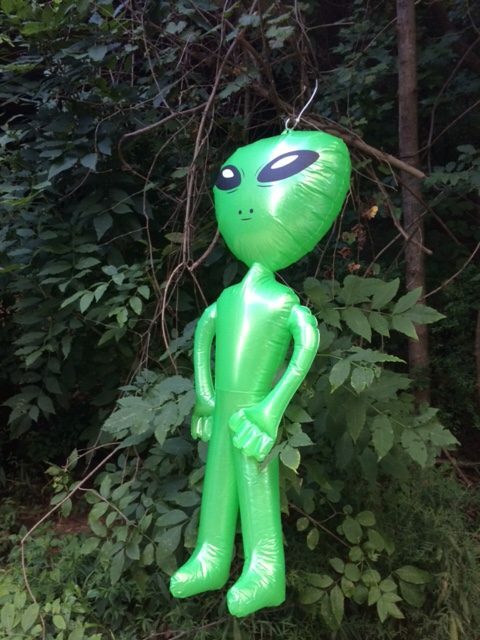 Last weekend, I participated in the Area 13.1 Alien Half Marathon in Roswell, Georgia. This is the event that I have been training for all summer long, through sticky, sweltering evenings and mercilessly hot weekends. Two weeks before the race, I caught a cold, which drained my energy, killed my taper plan, and turned into a nasty sinus infection. However, in spite of that, I felt well prepared going into the race, very well rested, and fully acclimated to the hot, muggy conditions of August in northern Georgia. The race started at 7:00 pm, to avoid the heat of the day and lend a spooky vibe to the whole alien invasion theme. At the start of the race, I lined up behind the 3 hour pacer. My goal time was 3:15, but I figured I would be able to hang with the 3:00 group at the beginning while the adrenaline was still running high. However, by mile 4, I had completely lost site of the group, as the pacer was laying down a pace much faster than that required for a 3:00 finish. I caught up with several other runners from the pace group around mile 6, who had also been dropped. Everyone pretty much had the same attitude about the pacer, which was “What was that?!”. I didn’t see the pacer again, but I understand from Steve and Dharma that he crossed the finish line well in advance of 3 hours, alone, having dropped the entire pace group. Because I am not a fast runner, I, and many others, ran the last half of the race in darkness, wearing headlamps, which was a nice novelty and made the second half of the race go by faster. I was doing great, feeling good, poised to finish well under my 3:15 goal, when all of a sudden I was on the ground in agony. I had caught my shoe on a heaved place in the pavement and fell – hard. I ripped open my right knee, badly bruised and gouged my left elbow, and scraped both my hands. I might have also slightly hit my head when I fell (more on that later). Additionally, though I did not realize it at the time, I twisted during the fall, landing on my left shoulder and injuring it, and badly wrenching my left knee. Two other runners stopped to help me, alerted to my fall by the loud string of obscenities. After a few minutes, I was able to get up. Blood was running down my leg and soaking the cuff of my sock, and I could feel the knee beginning to swell. I began to run, and reached a water stop about a half mile along the course. I poured some water over my knee and elbow, waved off medical assistance, and lit out of the finish line. I finished the race in 3:15:13, 13 seconds over my goal time. But since I spent at least 5 minutes dealing with the fall, I feel that I met my goal and then some. At the finish line, my husband and daughter got me to the medical tent, where I joined a woman who was getting an IV due to dehydration. A medic patched me up, but I was disoriented and was having some trouble answering questions. I am not sure if it was just the shock of the fall, or if I did hit my head, but I felt pretty out of it for the rest of the night. Steve and Dharma got me back to the hotel, then headed out for medical supplies and snacks. The next morning, I was sore and stiff from the fall, but otherwise felt pretty good, though obviously a little tired. I took advantage of the trip home to catch a nap. As the week progressed, my scraped elbow and knee have slowly, slowly begun to heal. My shoulder, which at one point hurt so badly that I could hardly lift my arm, seems to finally be on the mend as well. However, my left knee, which I twisted, has gotten progressively worse. Since Thursday, there is a sharp pain on the inside of the knee every time I put weight on it while it is bent. I believe that I strained my medial collateral ligament, or MCL, initially, but during the course of the week managed to worsen the injury. I am taking advantage of the weekend to ice my knee and establish a regiment of ibuprofen. I have also taken to putting a brace on the knee when I have to go up or down the stairs. Initially, after the half marathon, I was hoping to spend some time recovering, and then pick up the mileage and begin trying to train for a marathon this fall. I feel that my health has been really good this year, and that now is the time to finally try to run my first marathon. However, with my knee injury, I am not sure that I will be able to get back to training. I can hardly walk, much less run the 16-miler that I had planned for next weekend. So now I am just waiting to see if I can accelerate the healing. The bright side is that all those hours resting, icing, and elevating my knee will give me plenty of time to finish that sweater that I have been knitting!